Background: Indian information technology (IT) professionals are continuously subjected to project assignment changes as well as uncertainties in existing project continuations as cancelling of projects is not uncommon. There are periods in the work life of an Indian IT professional when he/she has to cope with no project situation, before being assigned to another project. IT professionals also need to continuously upgrade their IT-relevant skills in order to deliver projects to customers with less capital. All this adds up to job anxiety and perceived stress among IT professionals. With prolonged states of job anxiety and perceived stress, these professionals may become victims of diseases driven by anxiety and stress. There is a popular perception that Yoga, an Indian ancient science, can give control over modifications of mind and hence can help reduce anxiety and stress. Objective: To study the effect of cyclic meditation ( a yoga based practice) on job Anxiety and perceived stress of Indian IT Professionals. Materials and Methods: A control study was carried out on 96 Indian age ranged from 24 to 50 IT Professionals working in Bengaluru, Karnataka, India. Pre-post design was chosen and questionnaire method of collecting data was adopted. Results: The results indicates that after a period of 8 week intervention, there is a reduction of 19.51% in job anxiety and a reduction of 34.77% in perceived stress among Indian IT Professionals. Conclusion: This study indicates that Yoga based practices help to greatly reduce Job Anxiety and Perceived stress among Indian IT professionals. This study also highlights the need to explore the role of Yoga based practices on Indian IT professionals work life in greater detail. Over the past few decades, the information technology (IT) industry in India has been a story of huge success. As per the National Association of Software and Services Companies (NASSCOM) 2013 report on the IT-enabled industry, revenues grew from USD 100 million in the financial year 1992 to USD 108 billion in the financial year 2013. It is also estimated that revenues of the IT industry are bound to increase in the years to come and thereby provide more employment opportunities to the Indian workforce. While it is time to celebrate and feel proud of this huge success, one cannot forget the all-round effect of the IT industry on the worklives and personal lives of Indian IT professionals. IT professionals are always under constant pressure to deliver services efficiently, along with being cost-efficient. Indian IT professionals also need to continuously align to the country time zones of customers, which affects their sleep schedules. The current working conditions are prone to generate a lot of job anxiety for most India-based IT professionals as all project contracts are generally of a short-term duration. In a cross-sectional study conducted on 1,071 professionals from IT services and IT-enabled services working in Bangalore, Karnataka, India (IT capital of India), alarming facts were found: 31% of the professionals were found to be hypertensive with approximately 5% having malignant levels of hypertension. Health issues such as asthma, back pain, and peptic ulcer are also not uncommon among IT professionals. Issues such as anxiety and depression can be attributed to mental ill-health. Yoga is an ancient science that aims to empower one with sound physical/mental health and thereby provides mastery over modifications of the mind. In this current study, an attempt was made to evaluate the effect of a yoga-based practice on the job anxiety and PS levels of IT professionals by using scientific experimental methods. The IT field has highly fluid and rapidly evolving workforce requirements. Major events such as mergers, downsizing, new technologies, and industry changes may be sources of job insecurity and perceived threat., When PS levels exceed the coping abilities and resources available to an individual, the results are detrimental to the organization and the worker. The negative effect of perceived stress (PS) on various work-related outcomes has been widely documented. Examples of negative outcomes include increased absenteeism, high turnover, emotional exhaustion, deteriorating personal health, reduced organizational commitment, and lower job performance. There are many consequences of job insecurity including fear, job anxiety, and potential loss of the job. Job anxiety can be understood as fear and apprehensive mental state of the employee regarding various job components in relation to his/her frame of reference or his/her psychological makeup. It was also noticed that job anxiety could lead to work-related phobia, which is a feeling of panic when approaching work or thinking about work. A study conducted on employees from different professional settings of Germany revealed that job anxiety was different from trait anxiety and that job anxiety could lead to work avoidance and sickness absence. A quantitative study conducted on automotive workers in Malaysia revealed that depression, anxiety, and stress due to work conditions have a mediating role on perceived the quality of life. Being in a continuous state of anxiety and perceived stress gives rise to health issues for IT professionals, with depression being the major health concern. In a study conducted on computer-related health problems among software professionals in Mumbai, Maharashtra, India, it was concluded that ocular discomfort, musculoskeletal disorders, and psychosocial problems form the key category of health problems. In a study conducted on professional stress, depression, and alcohol use among Indian software professionals, it was observed that the software employees were professionally stressed due to job conditions and were at 10 times higher risk for developing depression; there has also been a significant increase in the incidence of psychiatric disorders. Yoga is an ancient science originating in India, which has components of physical activity, instructed relaxation, and interoception. Yoga includes diverse practices such as physical postures (asanas), regulated breathing (pranayama), meditation, and lectures on the philosophical aspects of yoga. In an experimental study conducted on personnel from a community in South Australia, it was observed that yoga was more effective than relaxation in improving mental health and thereby reducing stress and anxiety. The solution for attaining a mentally balanced state is dealt with in the ancient Indian text, Mandukya Upanishad. In a study conducted on the university staff from a British university, it was observed that yoga was effective in enhancing the emotional well-being and resilience to stress in the workplace. Based on ancient understanding, Swami Vivekananda Yoga Anusandhana Samsthana (S-VYASA) University (a world class yoga university) in Bangalore, Karnataka, India has developed a meditation technique called CM. CM is an "asana and meditation mix," which combines the practice of yoga postures interspersed with relaxation techniques. Yoga body postures (asana) such as the padahastasana, ardha chakrasana, ardhakati chakrasana, shashankasana, and ustrasana are used for stretching whereas shavasana is used for relaxing. This provides stimulation followed by relaxation at the muscular level as well as psyche level. It is a 35-min practice. Three hypotheses (as shown in, [Figure 1]: Research model) were studied as part of this experimental study. They were: Regular CM practice reduces job anxiety for Indian IT professionals (H1), regular CM practice reduces the PS for Indian IT professionals (H2), and job anxiety has a positive relation with PS for Indian IT professionals (H3). The sample size chosen for this quantitative study consisted of 96 IT professionals. All the IT professionals were selected from the Bangalore, Katnataka, India office of a multinational IT company, which has a presence in India, Germany, Singapore, Austria, the UK, and USA. Employees' position within the organization ranged from junior engineers to senior technical leads and people managers. All the participants came voluntarily to participate in the study. The study was conducted over a period of 2 months. The total sample size was divided into two groups, namely, the yoga group and the control group using simple random methods. The yoga group had both men and women employees with an average age of 31.04 years and standard deviation (SD) of 4.57 years. The control group had both men and women employees with an average age of 32.02 years with SD of 4.582 years. A daily 35-min CM was administered as an intervention for the yoga group. The control group was administered a walking physical exercise of 35-min duration daily. Both men and women employees with normal health as declared by the subjects themselves were included in the study. Subjects who volunteered for the study did not have any previous experience of participating in any yoga program, as declared by them. Job anxiety scale (JAS) as developed by A.K. Srivastava (1977) was used for assessing the job anxiety in IT professionals. Job anxiety constitutes of concerns in the components, namely- security, recognition, human relations at work, reward and punishment, self-esteem, future prospects, and capacity to work as per JAS scale. The questions in JAS scale have binary options such as "yes" or "no." PS was measured through the perceived stress scale (PSS) questionnaire developed by Sheldon Cohen. PSS questionnaire was designed to tap how unpredictable, uncontrollable, and overloaded respondents find their lives. The questions in PSS scale have five options for each question in order to take a snapshot of the existing mindset of the participants. Prior approvals from the authors/publishers of these scales were obtained for the purpose of this study. The JAS and PS questionnaires were administered to all members participating in the study from both the control group and yoga group. This was a pre-post study. Participants from both the groups filled up the questionnaires voluntarily before the beginning of the study period and at the end of study period. Scores obtained by the questionnaires were analyzed using Statistical Package for the Social Sciences (SPSS) 16.0 developed by IBM. [Table 1] below shows the mean and SD values of various components of JAS in the yoga group. As shown in [Table 1], the mean value of the job security concerns component decreased from 7.71 to 6.04 (21.61% decrease) between prestudy and poststudy. Similarly, the mean value for the self-esteem concerns component decreased from 7.52 to 5.7 (24.20% decrease), the mean value for the human relations at work concerns decreased from 10.27 to 7.77 (24.34% decrease). The mean value for overall job anxiety decreased from 58.85 to 47.37 (19.51%) decrease. [Table 2] shows the mean and SD values of various components of JAS in the control group. As shown in [Table 2], the mean value of the job security concerns component decreased from 7.79 to 7.31% (6.18% decrease) between prestudy and poststudy. Similarly, the mean value of the self-esteem concerns component decreased from 7.39 to 7.10 (4% decrease), the mean value of the human relations at work concerns decreased from 10.81 to 10.08 (6.78% decrease). The mean value of overall job anxiety decreased from 59.94 to 56.67 (5.45% decrease). [Table 3] indicates the significance of change in the job anxiety components between the yoga and Control group measured with Mann Whitney test. [Table 4] indicates responses on the PS component of the yoga group at the beginning and at the end of study period. The yoga group showed a reduction of 34.77% in the mean value of PS. The improvement observed in reduction of PS is very significant as P < 0.01. [Table 5] indicates responses on the PS component of the control group at the beginning and at the end of study period. The control group showed a reduction of 2.33% in the mean value of PS. The improvement observed in reduction of PS was not much significant as P > 0.05. As shown in [Table 6], the significance of change in the perceived stress component between the yoga group and control group was measured with Mann-Whitney test. The results of this study indicate that regular CM Practice reduces job anxiety for Indian IT professionals. It also indicates that regular CM practice reduces the PS for Indian IT professionals. It was also observed that job anxiety had a positive correlation with PS for IT professionals. Based on the empirical study conducted, it could be observed that the yoga group has performed well in decreasing PS and job anxiety. After conducting the study, the authors came to the conclusion that yoga-based practices could potentially reduce job anxiety and PS for IT professionals. Reduction in job anxiety and PS for IT professionals directly results in increased positive health and creativity at work. IT organizations can consider employing yoga-based CM as part of health programs for their employees. This study was conducted in only one IT organization; however, extending this study to multiple organizations and to more number of participants would have given more generalized results. The Indian IT sector has been witnessing an increasing number of female professionals every year, which is healthy for organizations as it brings diversity in the organizations' thinking. In the current study, not much specific studies concerning female and male professionals could be done. A more specific study concerning female as well as male professionals could be carried out in future research studies. Babu GR, Mahapatra T, Detels R. Job stress and hypertension in younger software professionals in India. Indian J Occup Environ Med 2013;17:101-7. Brohner J. The effects of work layoffs on survivors: Research, theory and practice. In: Staw B, Cummings L, editors. Research in Organizational Behaviour. Greenwich, CT: JAI Press; 1988. p. 68-96. Roskies E, Louis-Guerin C. Job insecurity in managers: Antecedents and consequences. J Organ Behav 1990;11:345-59. Sverke M, Hellgreen J. The nature of job insecurity: Understanding employment uncertainty on the brink of a new millennium. Appl Psychol 2002;51:23-42. Örtqvist D, Wincent J. Prominent consequences of role stress: A meta-analytic review. Int J Stress Manag 2006;13:399-422. Brown D. Wellness programs bring healthy bottom line. Canadian HR Reporter 2001;14:22-3. Mann SE. Employee stress: An important cost in mergers. Bus Insur 1996;30:13-9. Posig M, Kickul J. Extending our understanding of burnout: Test of an integrated model in nonservice occupations. J Occup Health Psychol 2003;8:3-19. Keenan A, Newton TJ. Frustation in organizations: Relationships to role stress, climate, and psychological strain. J Occup Pyschol 1984;57:57-65. Johnston MW, Parasuraman A, Futrell CM, Black WC. A longitudinal assessment of the impact of selected organizational influences on salespeople's organizational commitment during early employment. J Mark Res 1990;27:333-44. Boles JS, Babin BJ. On the front lines: Stress conflict, and the customer service provider. J Bus Res 1996;37:41-50. Ashford SJ, Lee C, Bobko P. Content, causes, and consequences of job insecurity: A theory-based measure and substantive test. Acad Manage J 1989;32:803-29. Srivastava AK. Construction and standardization of a job anxiety scale. Indian J Ind Relat 1977;13:73-84. Belkic KL, Landsbergis PA, Schnall PL, Baker D. Is job strain a major source of cardiovascular disease risk? Scand J Work Environ Health 2004;30:85-128. 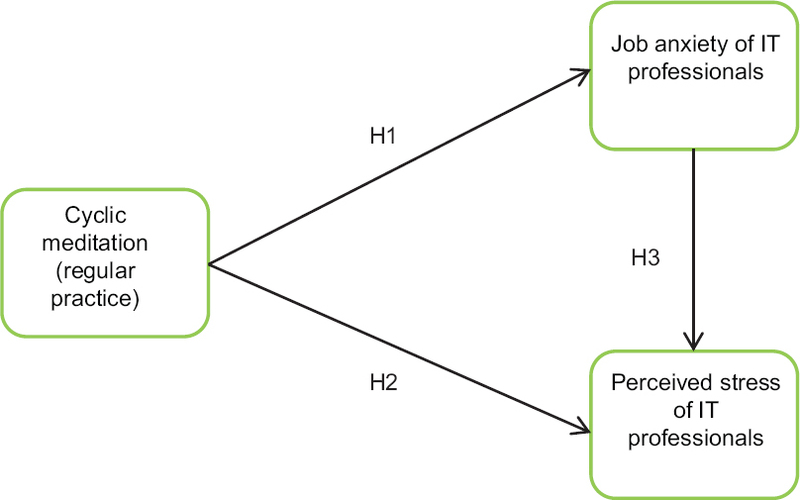 Muschalla B, Heldmann M, Fay D. The significance of job-anxiety in a working population. Occup Med (Lond) 2013;63:415-21. Rusli BN, Edimansyah BA, Naing L. Working conditions, self-perceived stress, anxiety, depression and quality of life: A structural equation modelling approach. BMC Public Health 2008;8:48. Shrivastava SR, Bobhate PS. Computer related health problems among software professionals in Mumbai: A cross-sectional study. Int J Health Allied Sci 2012;16:1-6. Darshan MS, Raman R, Rao TS, Ram D, Annigeri B. A study on professional stress, depression and alcohol use among Indian IT software professionals. Indian J Psychiatry 2013;55:63-9. Nagendra HR. Yoga its' Basis and Applications. Bangalore: Swami Vivekananda Yoga Prakashana; 2004. p. 48. Nagendra HR, Nagarathna R. New perspectives in Stress Management. Bangalore, India: Swami Vivekananda Yoga Publications; 1997. p. 56-78. Smith C, Hancock H, Blake-Mortimer J, Eckert K. A randomised comparative trial of yoga and relaxation to reduce stress and anxiety. Complement Ther Med 2007;15:77-83. Swamy C. Mandukya Upanisad. Bombay, India: Sachin Publishers; 1984. p. 27-38. Hartfiel N, Havenhand J, Khalsa SB, Clarke G, Krayer A. The effectiveness of yoga for the improvement of well-being and resilience to stress in the workplace. Scand J Work Environ Health 2011;37:70-6. Patra S, Telles S. Positive impact of cyclic meditation on subsequent sleep. Med Sci Monit 2009;15:CR375-81.